Trail running shoes may feel a little clunky on the road, but they're purpose-built to give you great traction and control on loose, slippery and uneven ground. Aggressive tread and multidirectional lugs grip the trail, while finely tuned uppers lock your foot onto the shoe's platform, giving you the control to navigate whatever the trail throws at you. ConsumerSearch editors evaluate trail running shoe reviews to name the best trail shoes, waterproof trail shoes, trail to road shoes, and the best trail runners for the roughest terrain. Experts just can't stop raving about the Saucony Peregrine 6's great all-around trail performance. They love its aggressive multidirectional lugs and sticky rubber outsole, the rock plate that protects your forefoot while still allowing the shoe to flex, and the bouncy, responsive Everun foam in the midsole. Most users love this shoe's ample toebox and high-volume upper and, like the experts, they just can't stop raving about its versatile performance, even on the steepest and roughest terrain. The La Sportiva Akasha draws kudos from experts and real-world users for its combination of foot protection and superior agility. They say that the grippy, multidirectional lugs and rockered, supportive midsole help create a smooth stride, even in the roughest terrain; and the foot-wrapping upper really locks your feet into place for a secure, well-controlled ride. Interestingly, the Akasha has no rock plate, but reviewers say the midsole is so protective that they don't miss it. Most trail running shoes feel unwieldy on the road, but the Hoka One One Challenger ATR 2 was purpose-built to cross over from trail to road and back again. Its low-profile lugs handle nicely on the road but are still aggressive enough for use in most trail conditions. Hoka One One's legendary high-profile cushioning is trimmed down to make the Challenger more maneuverable, but users with painful food conditions -- including plantar fasciitis and bunions -- still love this shoe. The Salomon Speedcross 3 is unbeatable when it comes to traction on soft, slippery surfaces that send most trail running shoes sliding. Reviewers say the soft lugs hold their grip on wet rocks, wet roots, and sometimes even in the snow. You have three choices of upper: regular synthetic, a water-resistant ClimaShield liner, or a full waterproof/breathable Gore-Tex bootie. Heads up: This outsole is tops in soft terrain, but won't last long in dry, rough conditions. Trail running shoes may look like burly road shoes, but subtle modifications make a big difference in performance. Most trail shoes have thicker soles and rubber toe caps than their road counterparts, the better to shield your feet from rocks and debris. They usually feel firmer underfoot, too, so you can get more tactile feedback from the trail. A trail running shoe's profile is also wider and lower than that of a road shoe, keeping your feet closer to the ground and lending extra stability on irregular surfaces. Supportive overlays on the upper protect you from abrasion and help lock your foot in place. Finally, most trail shoes sport multidirectional lugs on the outsole that are designed to offer good traction, whether you're going uphill or downhill. The deepest, most aggressive lugs grip loose terrain well, but can feel unstable on packed dirt trails or pavement. Softer lugs usually offer better traction on hard surfaces, but also wear faster. When choosing a trail running shoe, experts recommend focusing on the type of terrain you'll do most of your running on. Of course, your own running style comes into play too. If you're an agile runner who can avoid most trail obstacles (instead of running right over them) and you like feeling what's going on beneath your feet, the thin, flexible sole and snug, glove-like upper of a minimalist-inspired trail shoe may appeal to you. At the opposite end of the scale, you'll find shoes built for running right over obstacles on rugged trails, with more substantial soles and uppers and sturdier protective features, like rock plates, underfoot. We look for four main characteristics in every trail shoe we research: A comfortable fit, cushioning that's appropriate to the intended use, great traction, and the durability to withstand repeated use. These characteristics make trail running shoes a very popular choice for hiking in, too; but if you want more protection for your feet, we also offer a report on hiking boots. If you spend most of your time running (or walking) on paved surfaces, you might prefer our report on road running shoes instead. Finally, many runners have turned to fitness trackers as a fun, social way of tracking their progress and motivating themselves to keep going. We've done the research to find the best fitness trackers in several price ranges; check out the linked report to see the results. 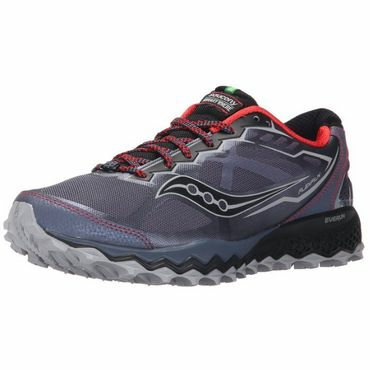 When it comes to just one trail running shoe that can handle all sorts of trails and varied conditions, from loose dirt to gnarly rocks and muddy obstacles, experts and users all agree that the Saucony Peregrine 6 (Est. $120) is tops. It draws an Editor's Choice award from Runner's World and rave reviews from testers with Outside and Competitor.com, too. The experts say the Peregrine 6 has just the right mix of cushioning and ground feel (the bouncy Everun foam in the midsole has been laboratory tested and proven to improve energy return), and the multidirectional lugs and sticky outsole are aggressive enough to handle steep, loose terrain without feeling clunky. The flexible rock plate in the forefoot is a nice compromise between protection and flexibility. Users love the Peregrine 6's welded upper -- they say it's the perfect mix of support, give and padding around the ankle. The only criticism we found is, much like the praise, unanimous: Everybody agrees that the wide forefoot and upper design are heaven sent for most foot types, but can leave runners with narrow feet feeling a little disconnected from the shoe on steep descents. The upper is also likely to give out before the tough outsole, although most runners should be able to get at least 200 miles out of a pair before that happens. The Peregrine 6 has a 4mm heel-to-toe drop, and a typical men's pair weighs 9.4 ounces. 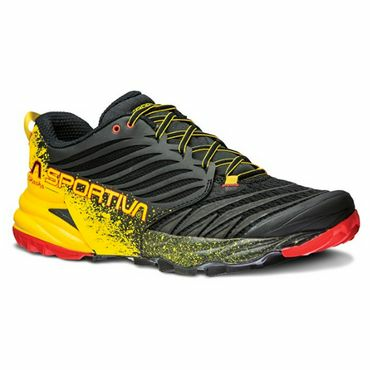 Narrow-footed runners, don't despair: Our top pick for running on rough terrain, the La Sportiva Akasha (Est. $140), runs toward a narrow fit, and it draws a lot of praise for its foot-wrapping upper that locks you in to the midsole for great control and lateral stability on rough terrain. (Heads up: It also runs a half-size short.) What expert testers really love about this shoe, though, is the way that upper combines with a supportive, rockered midsole and grippy, multidirectional lugs on the outsole to give you the perfect combination of protection, agility and traction on even the roughest, most technical surfaces. The Akasha doesn't have a rock plate underfoot, and users and experts alike are surprised to see that they don't miss it. The few testers who didn't like this shoe tend to complain that the thick midsole isn't flexible enough or that the heel collar is too high and rigid. Although it is relatively heavy (11.35 ounces for a typical men's size 9), most people say its responsiveness and agility makes it feel light underfoot; a 6mm heel-to-toe drop helps. Expect to start seeing outsole wear after 200 to 250 miles, although the shoe will still have substantial life in it. If you're into long, punishing trail runs or are a heavier runner, the New Balance Leadville v3 (Est. $125) is a great shoe that draws expert praise for resilient foam underfoot, a thick, rubberized toe bumper for extra protection, and a "roomy but not sloppy" fit. That extra space means some people go down a half-size for the best fit but, once the sizing is dialed in, reviewers are thrilled with how the upper allows plenty of room for a high-volume foot, but still snugs down to offer a good fit for narrow feet. A gusseted tongue does a great job of keeping "trail gunk" out, and at 10.4 ounces for a typical men's pair they're still very light, given the amount of protection you get. The manufacturer advertises an 8mm heel-to-toe drop, although Runner's World found the drop to be a little steeper. Trail runners with a tendency to overpronate love these shoes because of the medial post that helps keep your ankle from rolling in too much, and they're great for people with wide feet. The biggest criticism we found is that while the heel is very comfortable, it's too wide for some. One note: A couple of experts agree that even though the outsole on the Leadville v3 is plenty grippy for most terrain, it's better suited to long trail runs than short, agile courses with lots of fast cornering. Users say you can expect them to last between 250 and 350 miles before they give out. Most experts recommend having separate shoes for trail running and road running, because the grippy, aggressive soles that make a trail shoe excel off-road can feel clumsy when you're on the road. There are a couple of shoes that do a great job of bridging the gap between worlds, though. 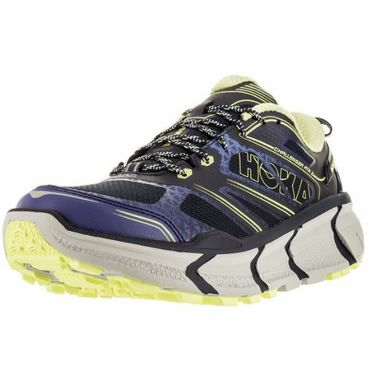 Our best reviewed shoe for this category is the Hoka One One Challenger ATR 2 (Est. $130), which is designed specifically for road-to-trail crossover performance and wins a "best update" award from Competitor.com. Experts love the Challenger ATR 2's "just right" balance of softness versus firm responsiveness and its surprisingly light weight (just 9.5 ounces for a men's size 9). One of the testers for Competitor.com likens its ride to that of a monster truck, because the thick, supportive sole rolls right over obstacles -- although when the trail really gets off-camber, the shoe's thick sole can leave you feeling a little wobbly. The low-profile 4mm lugs provide plenty of grip for most trail conditions without getting too squishy on the road and, like most Hoka One One shoes, the Challenger ATR 2's cushioning and forgiving 5mm drop from heel to toe makes it an excellent choice for people with foot problems, including plantar fasciitis and bunions. That said, the toebox on the Challenger ATR 2 is a little narrower than the previous model, so if you have wide feet you may need to size up; and these shoes tend to wear quickly on the sides of the toebox. Several users report that the upper starts to wear at around 200 miles, although you can usually get 350 to 400 miles of wear from the soles. If you do more road running than trail running, another excellent choice is the Saucony Triumph ISO 2 (Est. $80 and up). The Triumph ISO 2 happens to be our best-reviewed shoe for road running (see our report on running shoes for even more details and recommendations), but reviewers say the sole is also grippy enough -- and the midsole cushioned enough -- to handle some loose trail conditions too. Like most trail shoes, the Triumph ISO 2 is neutral-cushioned and suits most foot and gait types, and the Everun foam in the midsole gives it great cushioning while retaining a lively, responsive ride. As a bonus, the ISO "caging" helps the upper conform to almost any foot shape -- it's the closest we've ever seen to a universal fit. A typical men's pair weighs 10.2 ounces and has an 8mm heel-to-toe drop. All trail shoes are designed for some level of rough terrain and challenging conditions, but shoes meant for use in wet conditions have a little something special. Two special things, actually: The first and most important is an outsole that can grip securely, even on wet rock. The second is a waterproof/breathable or at least water-resistant upper that keeps your foot dry when you splash through puddles or wet grass, although obviously that dryness goes right out the window if you step into water that's deeper than the shoe is tall. For the full waterproofing treatment, our top pick is the Salomon Speedcross 3 (Est. $160), which comes in three versions. For about $130, you get the Speedcross 3's amazing traction on all wet and soft surfaces and a non-waterproof upper that users say dries reasonably fast. For around $145, you get a ClimaShield ("CS") version that's water-resistant and, users say, not terribly breathable. And for $160, you get a fully waterproof/breathable GoreTex liner. No matter which version you get, no shoe beats the Speedcross 3's traction on surfaces that would send a typical trail shoe sliding. Wet rocks, wet logs, mud, snow -- you name it, this shoe can handle it. When you're running on snow, the waterproofing/water-resistance of the GoreTex and ClimaShield versions add some insulation value to keep your feet warm. That said, there are a few caveats with this type of shoe. Users say that if you take the Speedcross 3 out in rough, dry conditions, the widely spaced, triangular lugs that give it such amazing grip on soft surfaces will wear down to nothing in three months or less. Also, this shoe tends to run narrow and a little bit long; some users end up going a half-size down. Some testers say that while the quicklaces and foot-wrapping upper create a precise fit, they don't leave much room for high insteps. A typical men's pair weighs 10.9 ounces and although the manufacturer doesn't advertise its heel-to-toe drop, expert reviewers put it at about 10mm. If all you want is great traction in wet conditions and to heck with the waterproofing, we think you'll love the Scarpa Neutron (Est. 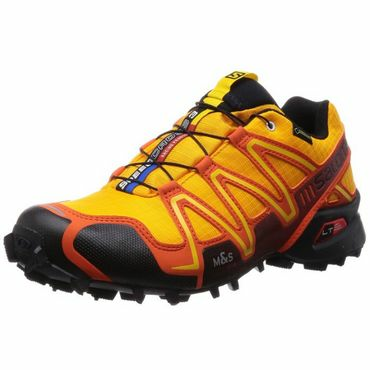 $130), which wins a "best debut" nod from Competitor.com, where testers say its great traction and foot-cradling upper give you lots of confidence on steep uphills and downhills. This is a high-volume shoe that some testers say runs a little narrow, perhaps because of that foot wrap; the end result is that if it fits, it also feels wonderfully nimble underfoot. Testers with Runner's World say they're also impressed with the sturdy build that can handle rough terrain and that even though the breathable mesh upper isn't waterproof, it sheds mud wonderfully. A typical men's pair weighs just 9.7 ounces and has a 6mm heel-to-toe drop. We found many useful expert reviews of trail running shoes. A few clearly stand out as the best, thanks to their extensive hands-on testing and balanced reporting of the results. Runner's World is, of course, top of the heap, along with Trail Runner Magazine, which specializes in exactly this sort of shoe. Feedback from trail testers with the running division of Competitor.com, GearPatrol.com and Outside Online is also extremely helpful. Finally, hundreds of user reviews posted to RoadRunnerSports.com and Amazon.com are the very best source of feedback on how the shoes perform in real-world conditions, and how they fit a varied population of feet.